Okay, congratulations indie games, you did it again. For a while I thought Capy's Super Time Force wouldn't make it to PC, which—given the reviews of its Xbone version —would have been a shame. Naturally, I was worrying over nothing. Not only will the 2D action time-travel-'em-up release on Steam on 25 August, but it'll arrive in a special Ultra edition. 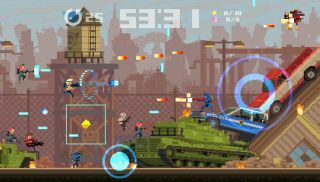 Super Time Force Ultra will, according to the developers, bring "50 new Helladeck challenge levels, inter-dimensional Ultra Force powers and 3 super-awesome, super-secret new characters". Those characters appear in the trailer as silhouetted figures. The second looks extremely like the TF2's Pyro, and the third like TF2's Saxton Hale. The first? If we stick with the TF2 theme, it could be Miss Pauling. Otherwise, I've no idea. If you think you know, jump into the comments. In Super time Force, you get to battle through levels. You also get to rewind time—switching characters to re-battle through levels with your past self at your side.